Today, a co-worker sent me an article with the headline '83% of Tattoo Ink Contains Cancer-Causing Chemicals'. A few months ago, I saw a Facebook post accusing Fairy liquid of being the culprit, and in the past, I've read that garlic has something to do with it. I'm pretty sure these 'articles' are out to make a quick buck from people's misery, and that tattoos don't give you cancer - and neither does garlic. That's why I try to avoid reading the news, and all the doom and gloom that comes with it. These days, what is a reputable news source? Don't get me wrong, I'm not doing a Trump - shouting 'FAKE NEWS' at every given opportunity. But, you've got to take everything with a pinch of salt. So, then, why are many of us constantly fooled by clickbait websites and marketing techniques? Time and time again, we've learned that when we click "9 Shocking Food Facts That'll Make You Never Want to Eat Again," it's going to be full of trash content. So, why do we keep clicking? I'm a curious person, and I suppose everyone is on some level. Are we searching for an escapism, or is the internet literally killing our brains? Maybe, we just can't stop. I remember the days of saying 'brb' on MSN Messenger, but nowadays we don't say it anymore... that's because we are NEVER offline. Even when I'm asleep, my phone is never more than an arms-length away. You could say we are the generation that's being tested on - after all, we don't really know how phones, computers and constantly staring at screens will affect us in the long-term. But, if we talking about the short-term, it might be what's causing our generation and next to be battling with mental health. At least as a child, I played outside, but I hate to think about young kids growing up with a tablet in their face. A lonely experience that is seemingly normal. Will the next generation compete for likes and followers instead of running in the egg and spoon race at school? Humans are naturally very social, but is a conversation in cyberspace a good enough substitute for the real thing? I think not. Can a 'like' on Instagram replace a compliment in real life? The happiness that comes from gaining an Instagram follower works on the same neurologic scale as drugs do - it releases that all-important dopamine into our brains. 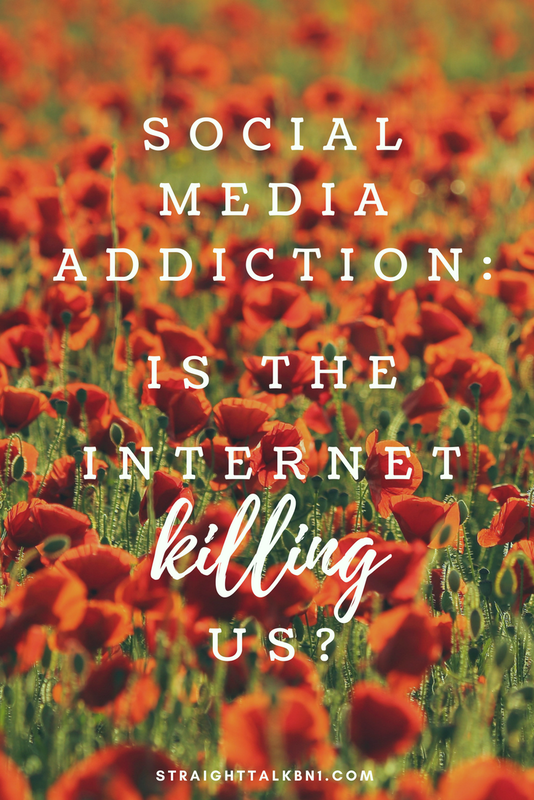 Is social media addiction going to be next epidemic? To be honest, it's hard to remember a time before Twitter (hold on, I used to have a profile on Bebo), and as it turns out, I've been using Facebook for more than 10 years. So, should we try to cut back our social media usage? I know when I'm working at my desk, I'll just automatically type in Facebook without realizing I'm doing it. The same auto-pilot technique I used to use for rolling cigarettes. Food for thought, eh?